February 2016 | New Creation Inc.
At New Creation our designers love pulling inspiration from the past and reinventing it into something new and exciting. 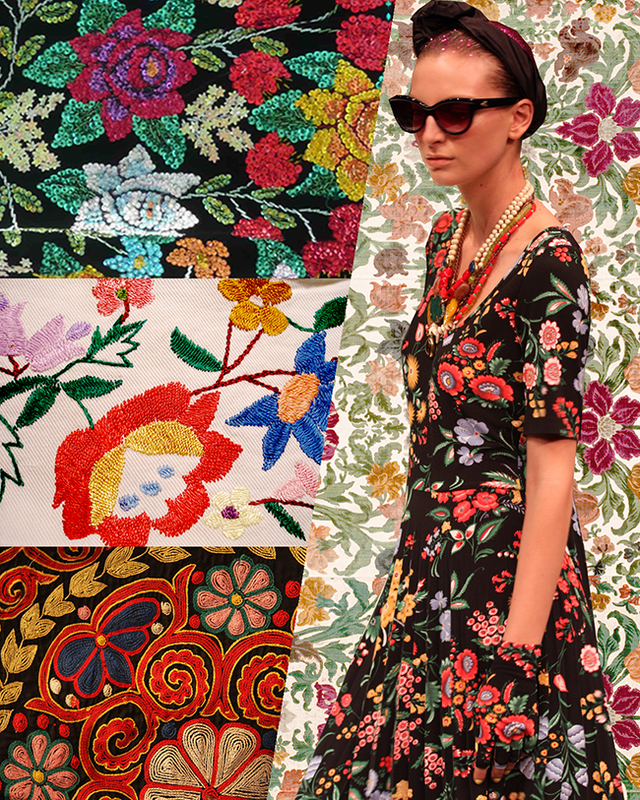 This week our focus is on Folk Art Florals. Perfect for Spring/Summer 2016 these colorful florals bring you back to a simpler time of cross stitching and hand woven tapestries. In today’s market these traditional florals are used in a number of mediums. Some designers prefer to stick to the traditional methods of embroidery and wovens. Others prefer to reinterpret them in more current mediums using sequins, screen print, digital print, and appliqué. At New Creation we can do any one of these techniques as well as many others. Myer Spring Summer Fashion Launch by Eva Rinaldi via Flickr -background of image has been cut out. Shared via the Creative Commons (Attribution-ShareAlike 2.0) license. Sequins Embroidered Skirt from Zalishchyky District, West Ukraine by MariyaZ via Flickr. Shared via the Creative Commons (CC BY 2.0) license. Furnishing Textile LACMA M.63.4.2 by Ashley Van Haeften via Flickr. Shared via the Creative Commons (CC BY 2.0) license.